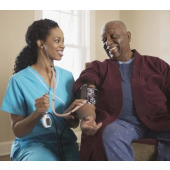 NPs that specialize in adult and geriatric health are known as adult-gerontology nurse practitioners (AGNPs). They serve patients from age 13 throughout the senior years. Though some AGNPs may have their own practice, many work in hospitals, rehabilitation centers, healthcare clinics, nursing homes, personal care services, assisted living and long-term care living facilities, and even correctional centers. The demand for AGNPs is so high, the Bureau of Labor Statistics (BLS) reports employment of NPs is projected to grow 36 percent from 2016 to 2026. Salaries are on the rise as well. In 2014, NPs averaged $95,350. High performers earned more than $131,050. Today NPs average $100,910, with high performers earning more than $140,930. Salaries in special industries and certain markets are often even higher AGNPs. For example, personal care services NPs averaged $136,280 in 2016, while those living in the Altoona, Pennsylvania metro area averaged $180,520. Northern California is another attractive market, with average salaries ranging from $132,380 to $158,050. If you are ready to take your nursing career to the next level, enroll in an accredited certificate program today. We’ve compiled below a list of accredited nursing schools with an online adult-gerontology nurse practitioner certificate program to help you get started.